Spread out across the early national landscape, the Beach and Cooke families were bound by the ties of family, friendship, and business. The brothers-in-law Samuel Beach, from Branford, Conn., and Samuel G. Cooke, from Mendon, Illinois, both served in the Civil War. As a corporal in the 27th Connecticut Infantry, Beach saw action at the battles of Fredericksburg and Chancellorsville, while Cooke served in the west with the 50th Illinois before taking a captain's commission in the 44th U.S. Colored Troops. Farmers and fruit growers, the two settled in Branford after the war, with Beach establishing Pawson Park, a day resort and picnic grounds that prospered in the 1880s. Spread out across the early national landscape, the Beach and Cooke families were bound by the ties of family, friendship, and business. Both families originated in New Haven County, Connecticut, but were divided in 1832 when Increase W. Cooke and his new wife Harriet Griffing began a new life on the prairies of Illinois. Settling in the small town of Mendon, Cooke taught school and served as a deacon in the local church while raising a family of three children, Samuel G. (1835-1915), Harriett, and Sara Elizabeth (Lizzie). When Increase died unexpectedly in 1847, just 39 years old, his widow returned home to Connecticut and settled in the shore town of Branford. Although Connecticut remained the family anchor, the east-west connections continued: after completing his apprenticeship as a carpenter in New Haven in 1855, Samuel Cooke returned to Mendon to take up farming. Samuel Beach was born in Branford on July 27, 1827, the son of Samuel Beach and Mary (Barker). In March 1851, he married the elder daughter of Increase Cooke, Harriett, raising a family of two daughters (Isabella and Harriett) and two sons (Paul and Samuel). Increase's younger daughter, Lizzie, married John A. Leggat in Mendon in May 1857. When the Civil War began, then, Samuel and Harriett Beach were settled in Branford and Samuel Cooke and Lizzie Leggat in Mendon. Samuel Cooke was the first to rise to his country's demands, volunteering in the fall 1861 for service in the 50th Illinois Infantry, a regiment that saw action from Fort Donelson through Shiloh and Corinth, and in the Central Mississippi and Atlanta Campaigns. While stationed in Tennessee during the spring 1864, Cooke left the 50th to take up a commission as Captain in the 44th U.S. Colored Infantry, which served in eastern Tennessee and Georgia through the end of the war. On August 31, 1862, Samuel Beach was drafted into the 27th Connecticut Infantry, a nine-month's regiment noted as much for the hardships of its service as its brief duration. Part of the First Division, Second Corps of the Army of the Potomac, the regiment was thrown into the toughest part of three of the most momentous battles of the eastern theater. At Fredericksburg in December 1862, the 27th sustained 110 casualties during the failed assault on Stonewall Jackson's forces on Marye's Heights. After a harsh winter spent in the mud along the Rappahannock gave way to spring, the 27th was swept by illness. Beach was among several who required hospital care to recuperate, and he was thus not present at the Battle of Chancellorsville, when eight of the regiment's ten companies were taken prisoner. Two months later je was in a convalescent camp when the regiment's remaining companies, much reduced, sustained fifty percent casualties the Battle of Gettysburg, fighting in the Wheat Field. Both Beach and Cooke returned to Branford after the war and found great success in farming and fruit culture, so much so that Beach reported real property of $40,000 in the census of 1870. Acquiring a large property on Indian Neck in 1866, Beach developed a popular day resort and picnic grounds there during the 1880s. With a pavilion at its center, Pawson Park featured dances, dinners, and roller skating among other amusements, with Beach renting the premises and providing catering for excursions sponsored by groups ranging from woolen manufacturers to the local chapter of the Grand Army of the Republic. Beach died in Branford in 1891, with Cooke following in 1915. Both of the brothers-in-law and their families are buried in Branford Center Cemetery. The papers of Samuel and Harriett Beach contain correspondence from two generations of a mid-nineteenth century Connecticut family. Of particular note are 31 war-date letters and a post-war memoir of the battle of Fredericksburg from Samuel Beach (27th Connecticut Infantry), and three war-date letters from Samuel G. Cooke (50th Illinois). The collection also includes an interesting, though scattered series of letters relating to the creation and operation of the day resort, Pawson Park, and three bound volumes that include records of a substantial business in raising strawberries and raspberries, apparently (in part) in partnership between the brothers-in-law. Samuel Beach's Civil War letters cover the bulk of his nine-month's service, from the early days serving in the defenses around Washington, D.C., through the turbulence of Fredericksburg and Chancellorsville. Addressed to his wife Harriett, the letters are exceptionally literate and richly descriptive, with two excellent letters detailing his experiences at Fredericksburg, and several on the long winter that followed and the infamous Mud March. After the war, probably in the early 1880s, Beach wrote out a stunning 17 page account of his memories of Fredericksburg, using free pages in the center of an ledger containing accounts of labor of his fruit farm (box 2:4). The exceptional detail and energy of the account suggests he may have been working from a diary or contemporary notes that have not survived. Far fewer in number, Samuel Cooke's letters include a reference to the battle of Shiloh; an account of engineering work near Corinth, Miss., in Nov. 1862, and crews of contrabands; and capturing rebel officers during a winter scouting in central Tennessee in December 1863. No letters survive from his time with the 44th USCT. Most of the other correspondence in the collection is to or from family members. Of particular note are Increase W. Cooke's letters to his wife Harriett (mother of Harriet Cooke Beach), which are a wonderful record of a New Englander evangelizing and teaching school in 1830s Illinois. The numerous letters from Increase's daughter, Lizzie Leggat, which reflect her focus of faith, family, and community, and farm life in Mendon during the 1850s. Finally, materials relating to Pawson Park offer an interesting, though partial glimpse into the growth of day resorts during the Gilded Age, and the challenges of creating an operation that could compete in the developing leisure market and that could navigate the logistical hurdles of bringing barges of tourists and supply them properly. 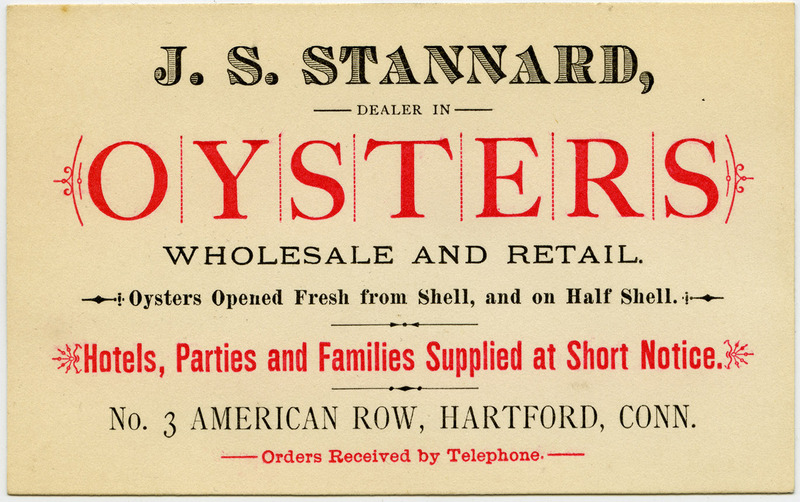 Some of interesting pieces of ephemera in the collection (such as the game tickets, wind engine price list, and oyster business card) are probably associated with Pawson Park, while others (e.g. the beautiful Victorian valentine) are presumably personal to the Beach family. Includes records of labor in raspberry and strawberry picking. Beach also used the volume to write out his memories of the Battle of Fredericksburg. Purveyor of oysters for hotels, parties, and families. Acquired from William Reese, April 2018. Commemorative biographical record of New Haven County, Connecticut. Chicago, J. H. Beers, 1902: 1052-1053. Processed by I. Eliot Wentworth, June 2018. Cite as: Samuel and Harriett Beach Papers (MS 1032). Special Collections and University Archives, University of Massachusetts Amherst Libraries.